Gordon Murriel Vince Lambertson was born Feb 27, 1940 to Murriel and Irene Lambertson in Hector, Minnesota. Gordon was born the 3rd of 9 children and grew up on a farm and attended District 45 country school near Strout and later attended Litchfield High School. After leaving school Gordy worked various farm jobs, then drove truck for Hatfield's until the early 60’s when he moved his young family to California and started in the iron working industry with his brother in law Francis Cram and brothers Rodney, Larry and Bruce. In the late 60’s he brought his family back to Grove City and built them a new home they lived in until moving into Litchfield. He continued Iron working and was employed for several different companies under The Iron Workers Union Local 512 for many years where he built sky scrapers, bridges and was involved in many large construction projects including the Mall of America. He was very proud to be part of that industry and formed lifelong bonds with many of his coworkers and partners in crime. 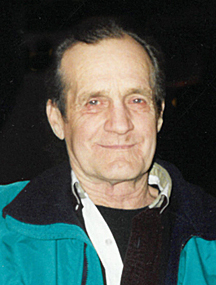 Gordy spent several years in the Buffalo area before he retired younger than most and enjoyed life. He moved on to his son’s resort on Rush Lake in Ottertail in 2000 to be near his sons and families. He enjoyed breakfast at the local café most mornings and playing with his Bobcat at the resort. He could be found putting around the resort on his golf cart or mowing the lawn in the campground on the riding lawnmower. He insisted on being busy every day and rarely sat idle for very long. He liked to visit and thoroughly enjoyed bullshitting anyone who would listen before asking “How do you like me now?” His grandchildren were his greatest joy of all. He teased all children mercilessly and loved to spoil them with ice cream and could be found watching by his door every afternoon to make certain his great grandkids got off the school bus safely. Gordy battled cancer for 4 months before being admitted into Hospice Care with Knute Nelson and passed within days at his home surrounded by many family members just as he wished. He was greatly loved by his family and will be dearly missed by anyone who knew him. Gordy was preceded in death by his parents Murriel and Irene Lambertson; sister Eunice Lambertson; brother Bruce Lambertson; nephew Larry Lambertson Jr.; brother-in-law Frances Cram; sister-in-law Carolyn Lambertson. He is survived by sons: Rick of St. Cloud; Tim (Heidi) of Ottertail; Jeffrey (Christine) of Alexandria; 9 Grandchildren; 14 great grandchildren; sisters: Gwen Cram of Grove City; Veloy (Lyle) Oldenberg of Litchfield; Linda (Larry) Wanous of Cokato; brothers; Rodney of Commerce City CO; Larry of Rancho Cucamonga CA; Lynder "Butch" (Sandy) of Oak Park MN; as well as numerous nieces and nephews.